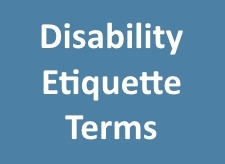 The following disability etiquette terms serve as a guide to more respectfully communicate with people with disabilities in all types of settings. Acceptable: People with cerebral palsy, people with spinal cord injuries. Unacceptable: Cerebral palsied, spinal cord injured, etc. Never identify people solely by their disability. Acceptable: Person who had a spinal cord injury, polio, a stroke, etc. or a person who has multiple sclerosis, muscular dystrophy, arthritis, etc. Acceptable: Has a disability, has a condition of (spina bifida, etc. ), or born without legs. Acceptable: Deafness/hearing impairment. Deafness refers to a person who has a total loss of hearing. Hearing impairment refers to a person who has a partial loss of hearing within a range from slight to severe. Hard of hearing describes a hearing-impaired person who usually has listening and hearing abilities adequate for most communication needs. Acceptable: Person who has a mental or developmental disability. Unacceptable: Retarded, moron, imbecile, idiot. These are offensive to people who bear the label. Unacceptable:Confined/restricted to a wheelchair; wheelchair bound. Most people who use a wheelchair or mobility devices do not regard them as confining. They are viewed as liberating; a means of getting around. Acceptable: Able-bodied; able to walk, see, hear, etc. ; people who are not disabled. Unacceptable: Healthy, when used to contrast with "disabled." Healthy implies that the person with a disability is unhealthy. Many people with disabilities have excellent health. Acceptable:A person who has (name of disability.) Example: A person who has multiple sclerosis. Unacceptable: Afflicted: a disability is not an affliction. If you have other suggestions to be added to this information, please send an email by clicking here. Thank you. Source for disability etiquette terms provided by the City of Sacramento, California Access Office. The website is cityofsacramento.org.